Narcissistic personality disorder (NPD) is a mental disorder characterized by entitlement (either overt or covert), self-centeredness, a (constant) need for admiration, a lack of empathy of others, and unreasonably high or low goals. At the same time, people suffering narcissism usually have low self-esteem and are very vulnerable to criticism (they tend to take criticism very personal). People suffering narcissism experience problems in many areas of life, such as work, relationships, and sports. At work or at school, people with narcissism can be unhappy or disappointed when they don’t get what they want (special favors or if they don’t get the attention/admiration they crave for). In relationships, people with narcissism may be very manipulative, controlling, demanding, and can play the victim when it suits them best. Recognizing just a few narcissism symptoms is not a problem at all. As a matter of fact, people may benefit from NPD symptoms, because they can maintain a positive self-image , and are motivating in terms of achieving goals . However, if people identify too much with the NPD symptoms, it can become a problem; if not for the narcissist self, then probably for the people surrounding the narcissist. Being the child of a narcissist. Online treatment for NPD or guidance for those living with a narcissist. At Barends Psychology Practice, narcissistic personality disorder treatment is offered. Contact us to schedule a first, free of charge, appointment. (Depending on your health insurance, treatment may be reimbursed). What are the signs of narcissism? There are different ways people with narcissistic personality disorder behave in certain situations and some of these behaviours seem to contradict each other. Someone with narcissism can ask for attention by boasting about their achievements or by pretending to be very sick or hurt in a dramatic way. They seem to be strong and confident while they boast, and weak and almost pathetic while they play the victim. Most people think of narcissists as boastful, rude, and selfish. Narcissists can, however, also behave insecure, avoidant, and as a victim. Usually, people with narcissism have feelings of insecurity, shame, humiliation, and vulnerability, and to get rid of these feelings, they may react outrageous or try to make people look bad or silly. It gives some narcissists a good feeling to belittle others around them. Narcissistic people may feel depressed or moody because they are not perfect. Feelings of depression could even develop when they experience a lot of rejection and criticism. Impaired ability to recognize or identify with the feelings and needs of others. Relationships largely superficial and exist to serve self-esteem regulation. Mutuality constrained by little genuine interest in others’ experiences and predominance of a need for personal gain. Goal-setting is based on gaining approval from others. They are often unaware of their own motivations. Personal standards are unreasonably high in order to see oneself as exceptional, or too low based on a sense of entitlement. Exaggerated self-appraisal may be inflated or deflated, or vacillate between extremes. Feelings of entitlement, either overt or covert. Self-centeredness and condescending to others. Firmly holding to the belief that one is better than others. Excessive attempts to attract and be the focus of the attention of others; admiration seeking. For more information about these criteria and for a proper explanation of these criteria, please go to: NPD symptoms. One may have noticed that the above mentioned NPD symptoms lean to different types of narcissism. 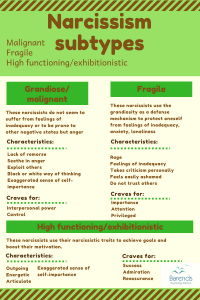 Some studies  point towards 3 narcissism subtypes: the fragile narcissist, the high-functioning/exhibitionistic narcissist, and the grandiose/malignant narcissist. The high-functioning/exhibitionistic narcissist could also be described as the ones who use narcissism in a healthy way. The fragile narcissist uses the grandiosity as a defense mechanism to protect oneself from feelings of inadequacy, anxiety, loneliness. This defense gives the fragile narcissist a chance to feel important and privileged. When this defense fails, rage and feelings of inadequacy follow. The high-functioning/exhibitionistic narcissist is outgoing, energetic, and articulate, but also have an exaggerated sense of self-importance. These narcissists use their narcissistic traits to achieve goals and boost their motivation. The grandiose/malignant narcissist does not seem to suffer from feelings of inadequacy or to be prone to others negative state but anger. They crave interpersonal power and control and use manipulation to achieve it. They show a lack of remorse, have exaggerated self-importance, and feelings, and seethe in anger. Narcissistic grandiosity: these narcissists often have grandiose fantasies, have a tendency to exploit people, respond with anger/rage when they are opposed/offended, and tend to behave in a self-sacrificing way if it boosts their ego. Narcissistic vulnerability: these narcissists often take criticism personal, experience mood swings depending on their self-esteem at the moment. They self-esteem can easily be affected by criticism. They often play the victim, and do not trust others (disappointed in others). Also, they can feel ashamed for others who do not life up to their expectations. 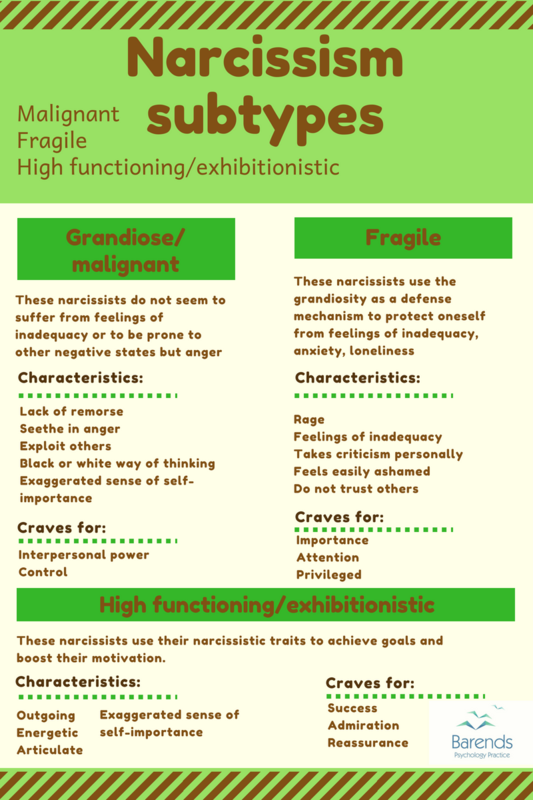 The fragile narcissist seems to resemble narcissist vulnerability, and the malignant narcissist seems to resemble narcissistic grandiosity. More research is needed to be able to draw conclusions. How does someone become narcissistic? Parenting styles, as well as biological predisposition, may contribute to the development of narcissism. Certain parenting styles seem to help develop unhealthy narcissism or exacerbate a biological predisposition already present. Especially the permissive/indulgent and authoritarian parenting styles can cause a lot of interpersonal difficulties, which may lead to unhealthy narcissism. Child worship and excessive praise by parents or caregivers can lead to the development of narcissistic personality disorder. When children hear that they possess talents other children don’t have, or hardly ever receive criticism, then they start to believe that they are gifted, special, and so on. Some parents praise their children in a way that doesn’t suit the occasion (rewarding a child with a huge gift when he cleans up his room, for example). This can help develop narcissism, because a child can develop a sense of entitlement or grandiosity. A lack of empathy or the absence of love can make a child constantly frustrated. Especially if it is unclear to the child when their parent(s) will show empathy and when they won’t. It can even become traumatic and lead to an unhealthy development: poor self-esteem, depression, the need to exploit others, and eventually narcissism. This parenting style is considered to be a good one. Both parents have important roles regarding nurturing the child: one parent can make up for the inadequacies of the other. Showing love and being emphatic and responsive will help a child to internalize these factors into a healthy self-object. Narcissism can be treated! But, and there is a big but, it’s difficult to treat someone who believes they are perfect, special, unique, etc. On top of that, most people with narcissistic personality disorder simply won’t seek professional help, unless they are forced to by their partner. For partners (parents, children, and friend) it can be really difficult to live with a narcissistic person. It can be so difficult that the partner threatens the narcissist to leave him if he won’t seek help. Schema therapy for personality disorders is significantly more effective than Clarification-Oriented Psychotherapy and ¨treatment as usual˝ (which means treatment consisted primarily of insight-oriented psychotherapy by highly experienced psychotherapists). Schema therapy results in a higher recovery rate, greater declines in depression, lower drop-out rates, and greater increases in social and general functioning. Pincus, A. L., & Lukowitsky, M. R. (2010). Pathological narcissism and narcissistic personality disorder. Annual review of clinical psychology, 6, 421-446. Pincus, A. L., Ansell, E. B., Pimentel, C. A., Cain, N. M., Wright, A. G., & Levy, K. N. (2009). Initial construction and validation of the Pathological Narcissism Inventory. Psychological assessment, 21, 365.